Property 2: Amazing 4 BR! Celebrity House! Sleeps up to 8!! Property 3: 4 BR-Sleeps 8! Famous Landmark Next to Bourbon St! Property 4: 5 BR-Sleeps 10! Best location next to French QT!! Wyndham Avenue Plaza Close To All Of The Excitement! Property 6: Wyndham Avenue Plaza Close To All Of The Excitement! Property 7: BEST DEAL! Large 5 BR! Steps from French Quarter! Luxury Italian Villa in Safe Neighborhood. Long Stays Welcome! Property 9: Luxury Italian Villa in Safe Neighborhood. Long Stays Welcome! Property 10: Best Location 7BR Next to French Quarter! Book NOW! Blocks from French Quarter for LARGE GROUPS! 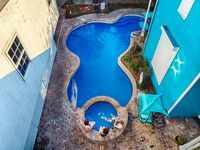 Property 11: Blocks from French Quarter for LARGE GROUPS! 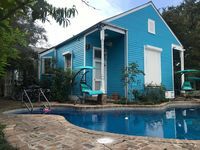 Mid City Villa 2 Blocks from Canal! Property 12: Mid City Villa 2 Blocks from Canal! Property 18: Spectacular 5 BR! Next to French Quarter, Bourbon! We were very happy with this accommodation. It is in a very central location (walking distance to everything! ), and the house and grounds are just immaculate. The staff on site was so very responsive to any request. We had 6 people, and we were all very comfortable. The kitchen is so well appointed - everything we needed. Wonderful, beautiful house! We loved our stay - kind employees and a great location, too.